Macaque (pronounced /məˈkæk/) is the common name for any of the Old World monkeys comprising the genus Macaca (/məˈkækə/), typically characterized by the presence of cheek pouches to carry food, and ranging from slight to heavily built and colors from shades of brown to black. While many species are characterized by short tails or no tails, some species have very long tails. Aside from humans (genus Homo), the macaques are the most widespread primate genus. Macaques are primarily found in Asia, from Afghanistan to China and Japan to Southeast Asia, including the Philippines and Borneo. One species is found in Northern Africa and Gibraltar. The macaques include some of the best-known monkeys, such as the rhesus macaque or rhesus monkey (Macaca mulatta) and the Barbary macaque or Barbary ape (M. sylvanus). Although several species use "ape" in their common name, given their lack of tails, these are true monkeys, with no greater relationship to the true apes than any other Old World monkeys. Occupying a wide geographic and ecologically diverse range, macaques provide important ecological roles, both as part of food chains and in seed dispersal. 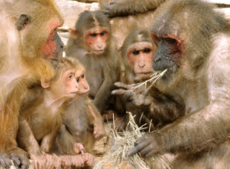 For humans, macaques, and in particular the rhesus monkeys and the crab-eating macaques, have been important animals for medical, psychological, and other scientific research, aided by having a similar genetic makeup and immunological, neurological, and reproductive systems as humans, and by their adapting well to captivity (Shidler 2007). In addition, macaques provide other values to humans, such as being trained to pick coconuts, or as popular sightings in the wild or in zoos, adding to the wonder of nature with their unique forms and behaviors. 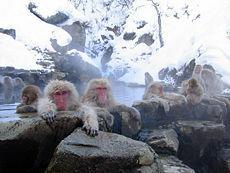 The Japanese macaques (Macaca fuscata) are particularly well-known, given their being seen sitting in hot springs in snow-covered areas in Japan (SDZ 2008). Bonnet macaque (Macaca radiata) seen in Nelliampathi mountains in Kerala, south India. One of the more interesting features of macaques are their cheek pouches, a feature that they share with some other Old World monkeys (SDZ 2008). Macaques stuff food into these pouches so that they can chew the food later. New World monkeys lack cheek pouches (SDZ 2008). 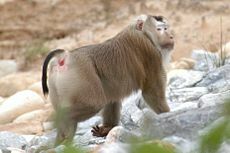 Some macaques are nearly tailless, such as the stump-tailed macaque (M. arctaides), some are tailless, such as the Barbary ape (M. sylvanus) and some have long tails, such as rhesus monkey (M. mulataa). The crab-eating macaque (Macaca fascicularis), also known as the cynomolgus monkey and long-tailed macaque, has a very long tail, which is longer than the body, with the body length of the adult monkey about 38 to 55 centimeters (15 to 22 inches) and the tail typically 40 to 65 centimeters (16 to 26 inches). While most monkeys are terrestrial, macaques tend to be more terrestrial, like baboons (SDZ 2008), or terrestrial and arboreal. Macaques are native to the following 22 nations: Morocco, Algeria, Tunisia, Afghanistan, Pakistan, Bangladesh, India, Nepal, Sri Lanka, China, Japan, Philippines, Bhutan, Brunei, Thailand, Burma, Cambodia, Vietnam, Laos, Malaysia, Indonesia, and Taiwan (PIN 2008). According to Melnick et al. (1993), the rhesus monkey "has the widest geographic range of any nonhuman primate," occupying habitats from sea level to over 3000 meters and from semidesert shrub to moist temperate evergreen forests throughout Central, South, and Southeast Asia. The crab-eating Macaque has the next largest range among primate species, with the native range including most of mainland Southeast Asia, the Malay Archipelago islands of Sumatra, Java, and Borneo, the islands of the Philippines, and the Nicobar Islands, as well as being an introduced species in places as diverse as Hong Kong, western New Guinea, Palau, and Mauritius. The Barbary macaque (Macaca sylvanus) is found in the Atlas Mountains of Algeria, Morocco and Tunisia, with a small, possibly introduced, population in Gibraltar, making them the only primates other than humans living freely in Europe. Macaques belong to the Cercopithecinae subfamily of the Cercopithecidae family. While the cercopithecines are mainly African, the diverse genus of macaques are Asian and North African. Other cercopithecines include baboons, mandrills, drills, geladas, and mangabeys, among others. Japanese macaque (Macaca fuscata) in Jigokudani Hot Spring, Nagano Prefecture, Japan. Macaques are similar in genetic makeup to humans and have similar immunological, neurological, and reproductive systems (Shidler 2007). Combined with the fact that some, such as the rhesus monkey and the crab-eating monkey, adapt well to captivity and are not endangered in the wild, they are popular animals for use in medical and scientific research (Shidler 2007). The rhesus monkey (Macaca mulatta), for example, is used in research projects involving understanding genetic and reproductive disorders, exploring age-related health conditions, and developing an AIDS vaccine (Shidler 2007). The cynomolgus monkey or crab-eating macaque (Macaca fascicularis) is best known for its use as the first test animal in clinical studies for development of the polio vaccine (Shidler 2007). In the late 1990s, it was discovered that nearly all (around 90 percent) pet or captive macaques are carriers of the herpes-B virus. This virus is harmless to macaques, but infections of humans, while rare, are potentially fatal. A 2005 University of Toronto study showed that urban performing macaques also carried simian foamy virus, suggesting they could be involved in the species-to-species jump of similar retroviruses to humans (Hall 2005). ↑ C. Groves, "Order Primates," "Order Monotremata," (and select other orders). Page(s) 161-165 in D. E. Wilson and D. M. Reeder (eds. ), Mammal Species of the World, 3rd edition (Johns Hopkins University Press, 2005, ISBN 08018822140). Brandon-Jones, D., and T. Rowell. Guenons, macaques, and baboons; Colobus and leaf monkeys. Pages 370-405 in D. W. Macdonald, ed., The Encyclopedia of Mammals. New York: Facts on File. ISBN 0871968711. Carroll, S. B. 2006. The Making of the Fittest. W.W. Norton and Company. ISBN 9780393061635. Hall, J. 2005. 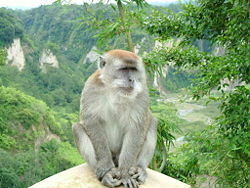 Performing monkeys in Asia carry viruses that could jump species to humans University of Toronto News, December 2005. Retrieved June 29, 2008. Melnick, D. J., G. A. Hoelzer, R. Absher, and M. V. Ashley. 1993. mtDNA diversity in rhesus monkeys reveals overestimates of divergence time and paraphyly with neighboring species Mol. Biol. Evol. 10(2): 282-295. Retrieved June 29, 2008. Primate Info Net (PIN). 2008. Macaque (Macaca sp.) National Primate Research Center, University of Wisconsin - Madison. Retrieved June 29, 2008. San Diego Zoo. 2008. Mammals: Monkey San Diego Zoo Animal Bytes. Retrieved June 29, 2008. Shidler, S. L. 2007. Macaques Wisconsin National Primate Research Center, University of Wisconsin - Madison. Retrieved June 29, 2008. This page was last modified on 25 August 2014, at 21:46.